Requirements: 64-bit/32-bit Windows 7, Vista, XP with an internet connection. System Mechanic restores more power, speed, and stability than any other product or service. Fully-integrated repair and optimization suite fixes problems, boosts speed, eliminates crashes, and prevents errors and problems from recurring. Patented ActiveCare® technology automatically and effortlessly fixes and maintains your PC when you aren't using it, so your computer runs like new for as long as you own it. Weekly Tune-up Definitions™ updates from iolo Labs ensure that your PC is protected against the latest performance threats and system flaws. System Mechanic provides complete ease and flexibility to help you speed up your PC no matter what your experience level. One-click power tools automatically perform vital services, intelligently diagnosing and resolving PC headaches and performance bottlenecks. Advanced tools such as Startup Optimizer, Program Accelerator, SSD Accelerator, and EnergyBooster give power users the total control they crave to fine-tune their system for absolute maximum performance. This award-winning and #1-bestselling software is trusted by millions worldwide to speed up, repair, and maintain their systems. 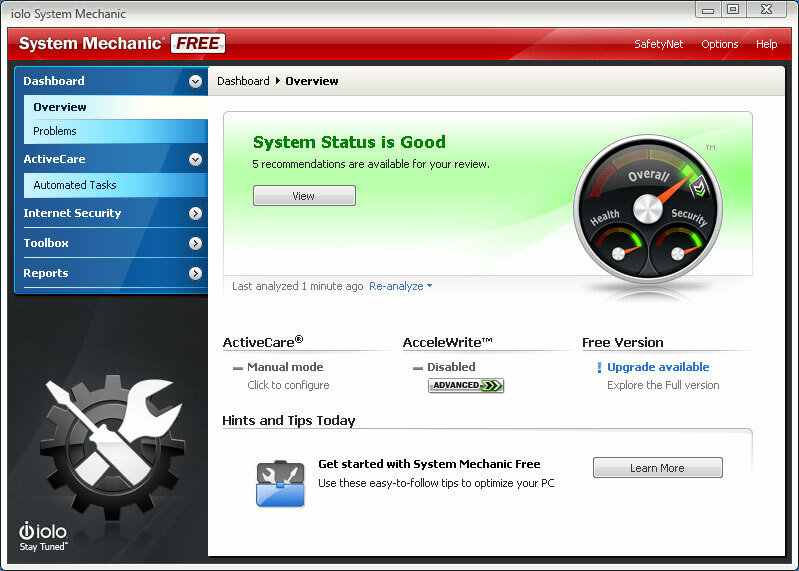 Find out for yourself why PC Magazine has called System Mechanic the "best tune-up tool available"!Now with more than 50 features, System Mechanic is precision-designed to restore speed for all nine major root causes of PC slowdown, maximizing your PC's performance in the following critical areas:-Faster Windows startup-Faster program launching-Faster program responsiveness-Faster internet browsing-Faster gaming experience-More available RAM memory-No crashes or freezesAnd more...Fully functional trial automatically checks and repairs your entire system, proactively diagnosing errors and slowdowns. Enjoy fast, reliable performance - no computer expertise required! 100% automatic PC tuneup and newly expanded Tune-up Definitions with weekly updates from iolo Labs, plus a comprehensive set of significant speed improvements. pc tune-up,pc tuneup,tuneup utility,tune-up,tuneup,slow,computer,registry,cleaner,fix,repair,defrag,defragment,hard drive,disk,system,errors,optimize,performance System Mechanic restores more power, speed and stability to your PC than any other product. Fix problems, boost speed, eliminate crashes, and prevent errors from recurring. Millions trust this #1-selling software to repair and optimize their systems.